These Simple Womens Self Defense Techniques May Save Your Life! NOTE: This information is provided as general advice only. Womens self defense techniques many times are the same as self defense techniques used by everyone. Women many times are more valnerable then a man and are often targeted more then men. A good self defense course is the best way to learn how to protecty yourself from the dangers of modern society. There are several places you should target an individual when attacked. The eyes, throat, groin and knee will be your best chance to disable your attacker and get away. Depending on the situation you may find that gouging an eye is best yet in another situation a knee to the groin may be your best option. Every situation is different and with a little quick thinking you will find the time to strike then run. When you strike, be sure to strike hard so you have ample time to get away. Using one of the many womens self defense products is a great way to defend yourself. A stun gun, pepper spray, taser gun, expandable baton or even a personal alarm could mean the difference between life and death. In general these products are very affordable and the benefits of carrying one far outweigh the few dollars you may spend to get one. Items such as a taser gun or self defense spray can give you the advantage of a defenseive distance. A high power stun gun could even scare off an attacker just by the high voltage sound that it makes. 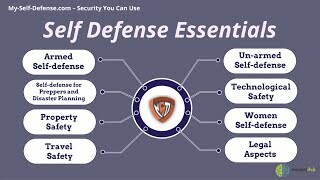 When self defense products are illegal or not available, a personal alarm will give you a much better chance of warding off an attacker then going without. Take the time, spend the money and put a little motivatin behind being prepared. Self defense classes and self defense equipment will pay off big time in the long run. Will YOU Be Able To Defend Yourself From A Carjacking?